I have said many times on the blog that I am not a baker. And I know I have said more then once that I do not like making cookies. So, the fact that I have two cookie recipes to share with you is odd for me! This cookie recipe came to mind after a co-worker suggested I bake something without peanut butter. And I am happy for her suggestion, because these cookies are out of this world! My sister helped me test the recipe this past weekend and we both stood in my tiny kitchen speechless at how delicious these cookies turned out. We said words like, oh my goodness these cookies are AMAZING, delicious and out of this world! Yea, we thought they were pretty good! These little cookies are melt in your mouth delicious with a hint of coconut and chocolate. 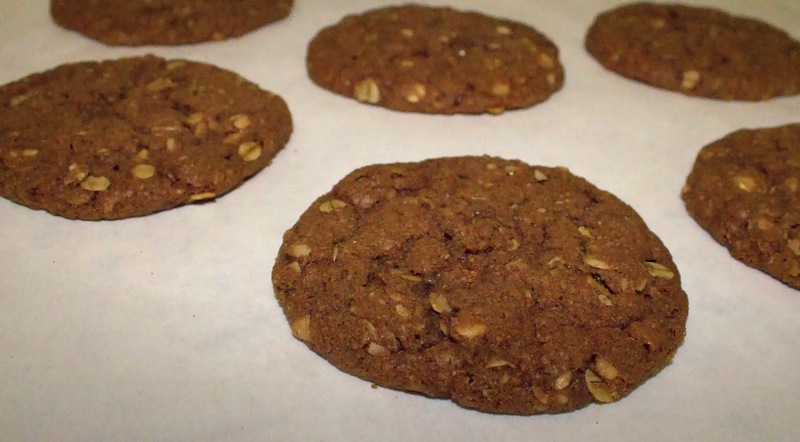 The Heath pieces give the cookie a nice crunch while the oatmeal adds great texture! One of my lovely taste testers commented that they reminded her of an Almond Joy candy bar, and I couldn't agree more! I will warn you that it is hard to eat just one of these cookies! Bake at your own risk, but enjoy! 3- In another bowl combine your dry ingredients; Oats, flour, cocoa powder, and baking soda. Stir until well combined. 4- Slowly add your dry ingredients into your wet ingredients. Use your hand mixer and mix until wet and dry ingredients are well combined. Set hand mixer aside and stir in Heath pieces. 5- Role dough into 1" balls and place on an un-greased cookie sheet. Bake for 16 minutes. Allow cookies to cool on pan before removing. Repeat with the remaining dough. **Note: Cookies should be stored in an air tight container. They will become crunchy so store with a piece of bread to ensure the cookies stay soft.